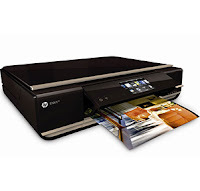 Download HP ENVY 110 Driver for Microsoft Windows, Mac OS X, and Linux below this description. HP Envy 110 e-All-in-One printer is the successor of the old version that is HP Envy 100 printer. The Envy 110 comes in a black design version, it allows you to print, copy, and scan, as well as scan to e-mail. In addition, you can also download additional apps from the HP ePrintCenter such as ePrint that use to attach and print out the e-mail or files. In addition, The HP ENVY 110 also support for eFax, a third-party service that lets you send up to 20 fax pages and receive up to 20 pages per month for free, its no phone line needed. Plus, it also can print from iPhones, iPads, and iPods touch over a Wi-Fi connection using Apple’s AirPrint feature built into iOS 4.2. The Envy 110 delivers a port for a USB drive, a multi-format card reader, behind a protective door. In addition, Envy 110 can connect via USB or wireless connection in your workplace or small offices.